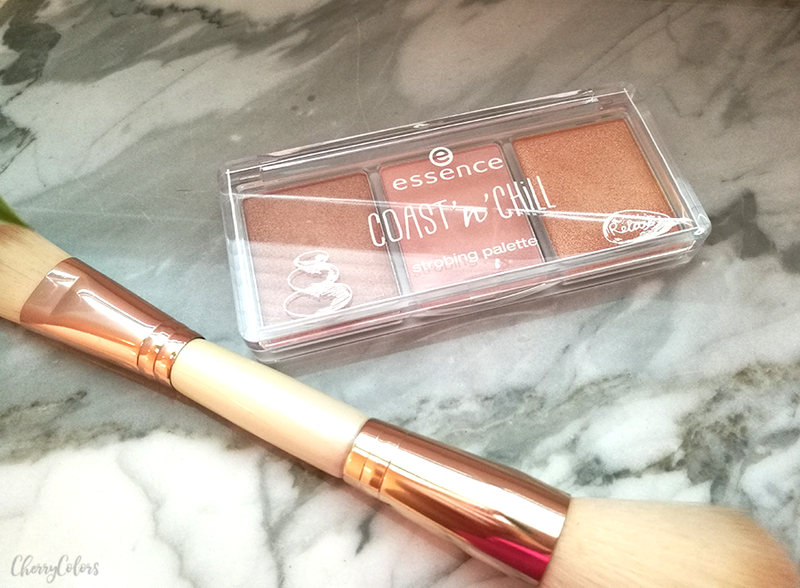 Essence Coast'n'Chill Strobing Palette - Cherry Colors - Cosmetics Heaven! With the end of Summer, Essence came out with a Trend Edition called Coast'n'Chill. sea you soon! from september to october 2017, the new essence trend edition “coast 'n' chill” whisks you away to the seaside. make-up products in blue, sand and warm rosewood shades inspired by the lifestyle at the coast are perfect for laid-back evenings in the late summer. 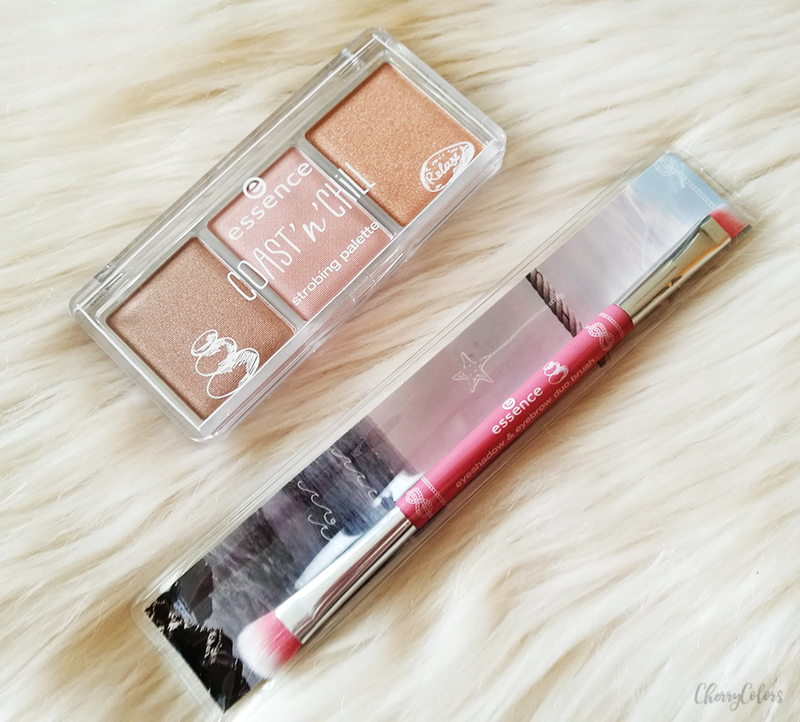 From it, I got two products - an eyeshadow and eyebrow duo brush and the strobing palette. 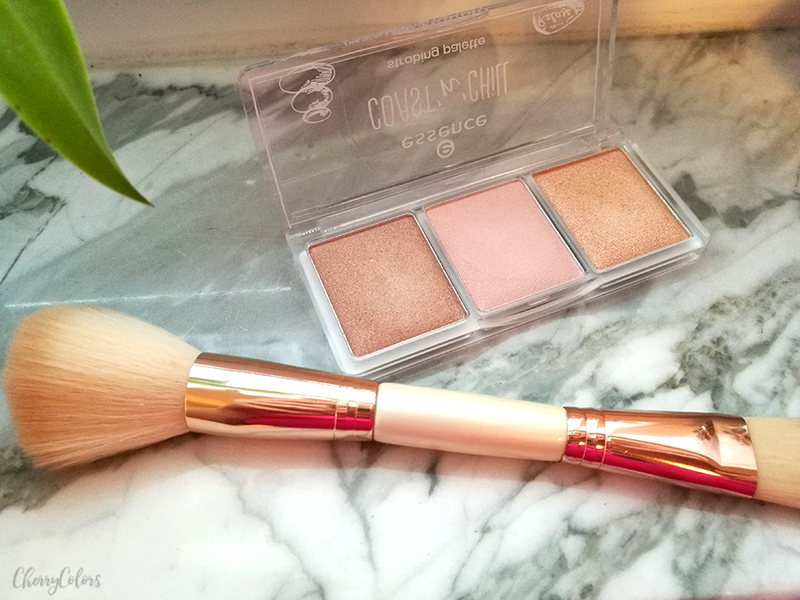 Essence Coast'n'Chill strobing palette - 01 Be happy & shine more! the three perfectly aligned shades ensure a summery glow – to make the warmer months of the year last a little bit longer. The palette comes in a clear plastic casing that looks a bit cheap but it is sturdy enough to survive a trip or two. In the palette, there are three strobing colors - bronze, pink and gold. All of them have finely milled shimmer. Only the pink feels a bit powdery and doesn't look as good as the other two do. Bronze - the one with the finest glitter. It's very subtle and would look lovely as an eyeshadow. Isn't "in your face". Cool toned. Pink - with the first use it's very powdery but gets less and less with use (is there some sort of coating on it?). It has a slight iridescent look to it. Cool toned. Gold - comes with the biggest shimmer chunks. They are visible to the bare eye and that's what makes it stand out. I think they look best when you combine all three of them - the pink as a very light blush, the bronze as a shiny bronzer (which is a thing that I'm currently loving) and the gold as a wawawom highlighter. The palette is lovely but it's not something that you must have. Two of the three colors are subtle enough to be worn every day if that's something that you do. 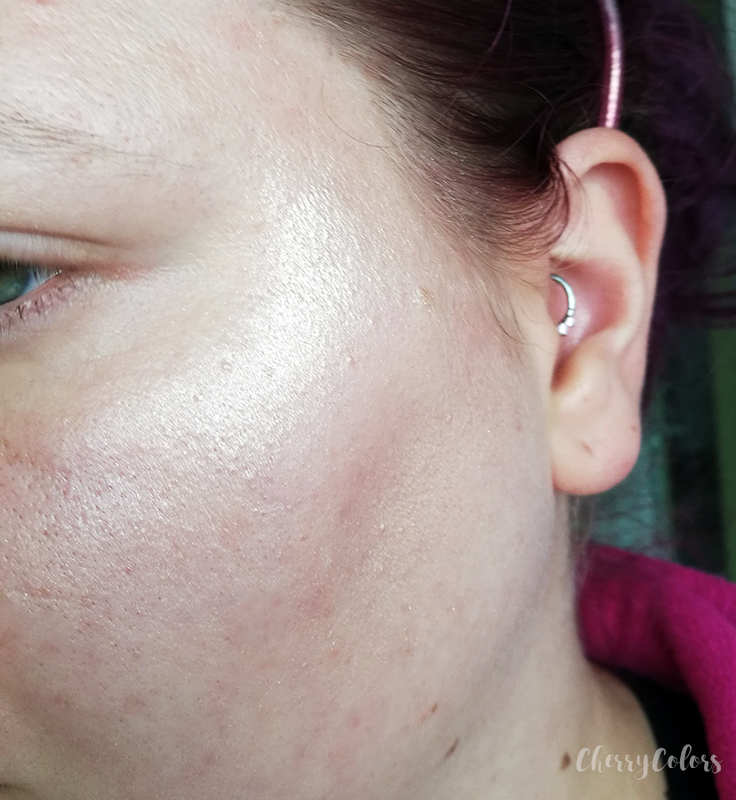 For this photo, I applied all three on my bare face - which is not the most flattering thing as there are an uneven skin texture and color below the highlight. The golden was used as a highlighter, the pink as a blush and it didn't really show up and the bronze as a bronzer which also isn't all that visible. I tried to like this palette but I just can't. 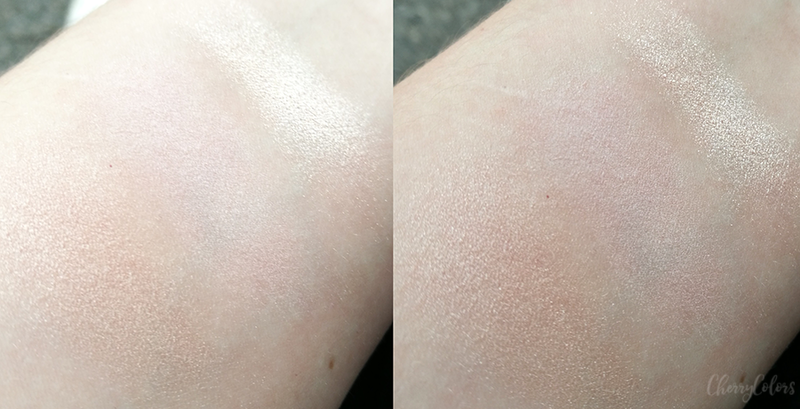 It bothers me that the pink color is just invisible on my skin and it's was also powdery for the first or two uses. The gold color is however just lovely. I wish it was available as a single highlight color. :) Other than that I think that it is interesting but not enough to be something that everyone would want to have in their collection. For me, it's just not worth it. However, the brush is fine - I am a big fan of Essences' brushes and this is no different.